There is downside to having a set image, audiences expect their hero to live up to it. You’d think a film starring Kapil Sharma (also produced by him) would be cheeky and funny. 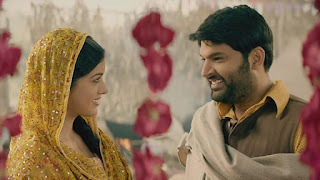 Firangi, somnolently directed by Rajiev Dhingra is a clanger any way you look at it. There is very little interest in Raj era films now, unless they are entertaining or ultra patriotic or both, eg. Lagaan. Firangi seems to be inspired by that film, but then Sharma is no Aamir Khan. Worse, he is a bit overage to be playing a gullible young chap who believes the British are not all bad (“they built the railways”) or making gooey eyes at a village belle. Manga (Sharma) is a happy—go-lucky Punjabi villager who is berated by his father for being jobless. Which is why is cannot find a girl to marry him. Then he finds work as an orderly to a Brit, Mark Daniel (Edward Sonnenblick), but the grandfather of the belle named Sargi (Ishita Dutta) won’t accept the proposal because he is a Gandhi-influenced freedom fighter. Daniel is smart enough to figure out that the British won’t rule forever, so coaxes a nutty Raja (Kumud Mishra) to invest in a booze factory with him. The only problem is that the ideal site is Sargi’s village, and the Raja orders the people to be evicted. How can the loyal servant of the British allow his beloved to be ousted from her home? So he comes up with a hare-brained scheme to save the village. The film plods at snail’s pace, and lacks even a smidgen of humour. Had it been snappy and funny—which it could well have been—Firangi might have been rescued. But its fine supporting cast is wasted on a lethargic movie. At a run time of two hours and forty minutes, it’s akin to torture. Kapil Sharma does have screen presence and could act if he were given a role worth his while. Better luck next time!